Bridge – decreasing the distance between one bank to the other. The main function of the bridge. Bridge – residence and dwelling. Loft-apartments for work and living. Activating the spaces night and day, year round. Bridge – the place for entertainment. The length of the bridge allows for a range of activities suitable to all tastes and age groups. 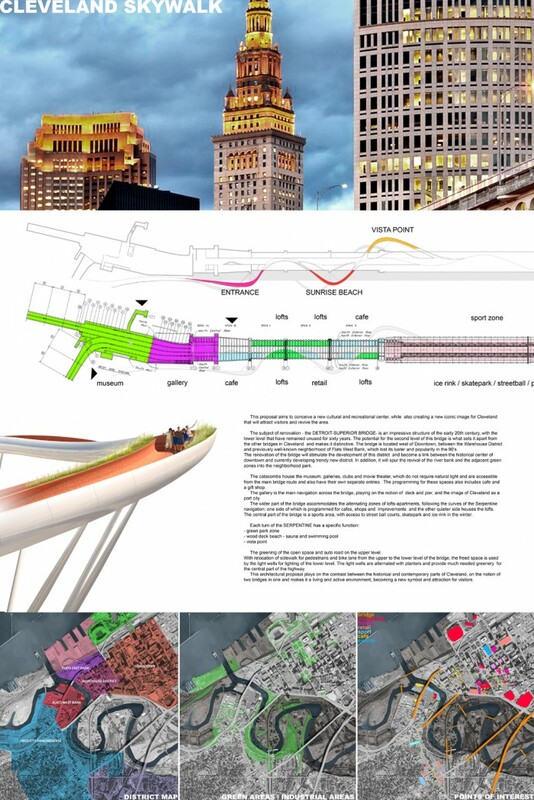 This proposal aims to conceive a new cultural and recreational center, while also creating a new iconic image for Cleveland that will attract visitors and revive the area. The subject of renovation – the DETROIT-SUPERIOR BRIDGE- is an impressive structure of the early 20th century, with the lower level that have remained unused for sixty years. 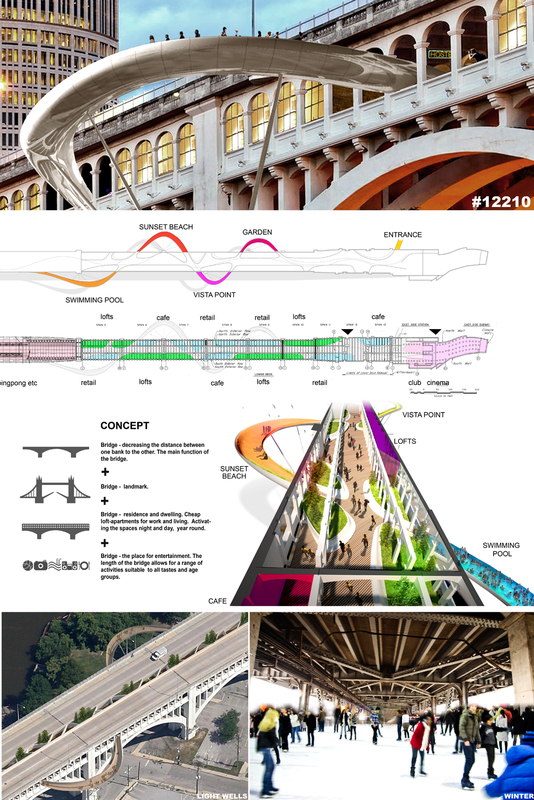 The potential for the second level of this bridge is what sets it apart from the other bridges in Cleveland and makes it distinctive. The bridge is located west of Downtown, between the Warehouse District and previously well-known neighborhood of Flats West Bank, which lost its luster and popularity in the 90′s. The renovation of the bridge will stimulate the development of this district and become a link between the historical center of downtown and currently developing trendy new district. In addition, it will spur the revival of the river bank and the adjacent green zones into the neighborhood park. The catacombs house the museum, galleries, clubs and movie theater, which do not require natural light and are accessible from the main bridge route and also have their own separate entries. The programming for these spaces also includes cafe and a gift shop. The gallery is the main navigation across the bridge, playing on the notion of deck and pier, and the image of Cleveland as a port city. The wider part of the bridge accommodates the alternating zones of lofts-apartments, following the curves of the Serpentine navigation: one side of which is programmed for cafes, shops and improvements and the other quieter side houses the lofts. The central part of the bridge is a sports area, with access to street ball courts, skatepark and ice rink in the winter. The greening of the open space and auto road on the upper level. With relocation of sidewalk for pedestrians and bike lane from the upper to the lower level of the bridge, the freed space is used by the light wells for lighting of the lower level. The light wells are alternated with planters and provide much needed greenery for the central part of the highway. 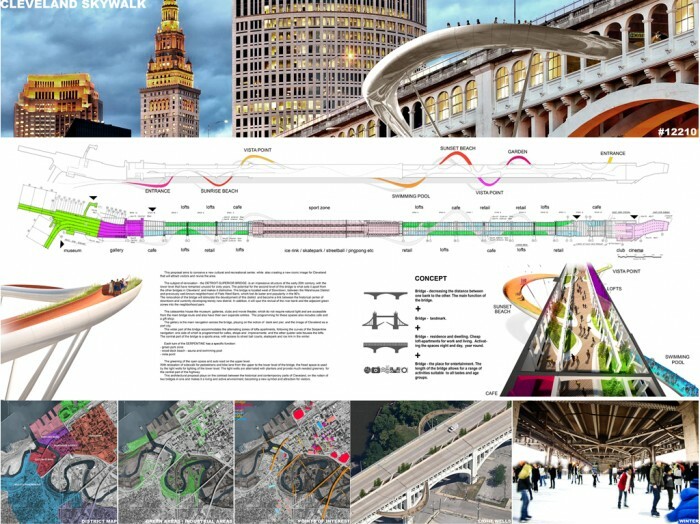 This architectural proposal plays on the contrast between the historical and contemporary parts of Cleveland, on the notion of two bridges in one and makes it a living and active environment, becoming a new symbol and attraction for visitors.